Rules of composition that apply to most art and design disciplines also apply to garden design. Understanding these underlying design ideas and how to apply them in your garden is one factor you pay for when you invite a landscape designer to suggest changes or install a new garden area for you. Why pay for that knowledge, when the basic principles are so easy to understand and implement? Presented on this page are four key ideas related to design. These rules of composition are some of the defining characteristics of any successful design. All four of these rules of composition are demonstrated in the garden pictured near the top of the page. Looking at the photo of the garden, you get a warm, welcoming and peaceful feeling. The appearance of the very ordinary home has become nothing short of spectacular. This is achieved because the designer understood these key ideas. Each of the videos below demonstrates one of these rules of composition. Don’t get distracted by the fact that a couple of these videos are focused on other design disciplines, such as art and photography. These principles are universal design principles. The ideas you will see presented here can be applied as you think about your garden design. I am going to present these rules of composition and then I will show you how they apply in the garden pictured above. I hope that this process will clearly demonstrate to you how to think about your garden space. The four rules of composition we’ll discuss here are figure and ground; leading lines; the rule of thirds; and the golden mean, or divine proportion, as it is often identified. All of these rules of composition are about creating points of focus in your design. They ensure that the viewer is looking at the areas that we want them to observe, while minimizing other elements of the design. Figure and ground is also referred to as positive and negative space. A good design is cognizant of this rule of composition, even though applying this rule of composition to the garden can feel a bit abstract when applying it to the garden. In the photograph at the top of the page, note that there are several flowerbeds hugging the outside edges of the lawn, and a bed that has been introduced in the center of the lawn to the right of the photo. 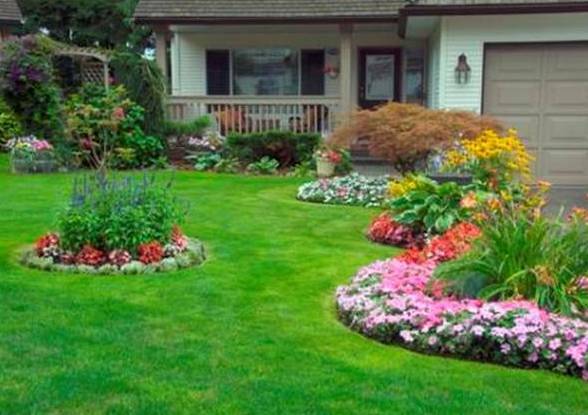 The positive spaces, or figures, are the flower beds, and the lawn itself becomes the ground, or negative space. Figure and ground can be thought of as an area of interest (figure) and background areas (ground). The interest areas in the garden above then are those with color and form including the house itself, while the backdrop that highlights those interest areas is the lawn. Without the lawn, the gardens would be nice enough, but they would not stand out as areas of focus. The concept of figure and ground may be applied to the skyline, to a single garden bed, or to an entire garden space. Think this way as you approach all aspects of your garden design. Another rule of composition is the idea of leading lines. The use of leading lines is simply using lines to focus the viewer on key points of emphasis within the garden by directing them at the garden areas we want to emphasize. Watch the video for some ideas about how leading lines can be used to focus attention on important areas of the garden. As you watched the video, did you notice that in every photograph, leading lines pointed you to an area of focus? Doorways, garden benches, garden beds, landscape timbers, and many other emphasis points were enhanced by the concious use of line. Lines, whether curved, straight, or zig zagged, redirect the eye to areas of interest, and form the basis of some of the garden features. If you didn’t notice these things as you watched, take a moment to watch it again and pay attention to those lines which focus your attention to areas of emphasis within the garden. Our subject garden demonstrates these characteristics as well. Note the angle of the bed in the forefront of the picture that is filled with pink petunias. Then notice where the line formed by the front of the bed leads you to focus? It is the small garden bed in the line that gets that honor. It continues the implied line, adding a sense of order to the garden. The hard line of the front porch is continued by an arbor. The arbor is planted with clematis, which further extends this leading line. The shape of the gardens near the drive create a leading line that meanders back and forth along the drive and is continued through the front planting bed and culminates to the left of the photo. Rules of composition such as leading lines help create a sense of order and focus your attention on the entire garden design as a unit, rather than the beds appearing to be unrelated garden spaces. They unify the design, and focus the attention on the whole scene, rather than upon the individual parts that make it up. The rule of thirds is typically applied in the field of photography, and is another of the rules of composition that is absolutely at work in any peaceful or dynamic landscape. Again, we are focusing on the entire garden space, rather than on any one element. Watch the video to get an idea of what the rule of thirds is all about. So how does this apply to the garden? When you are placing the major elements of your design, remember the rule of thirds. What works with an image, also works with the garden. For this discussion, you must think of your garden as a series of viewpoints, or “pictures”. To get a feel for thinking this way, take a look out a window at a view, and apply the rule of thirds to what you see. It is no different than applying it to a photograph. The rule of composition still applies. Most people tend to place trees in the center of a garden space, which is not only a bit of a maintenance nightmare, but also is very boring. Taking that same tree; placing it to the left or right of the center creates a much more dynamic composition. This is the rule of thirds being applied to a garden space. The tree is placed against one of the “power points” in the rule of thirds. Another example of how to apply the rule of thirds in garden design is in the placement of walls and garden features. Water fountains, patios, barbecues, or other visually important features in the garden placed against these power points in the grid create drama and a sense of unity. If these design elements are placed in the center of a composition they become static, and much less interesting than if that same element is placed at the rule of thirds intersection point in your visual space. This rule of composition is played out beautifully in the example photo we have been using. The photograph is representative of what passerby will see when they view the garden. The garden bed in the lawn plays an important role! It is placed at one of the power points in the view. Looking at this picture of that garden, the power point in use for that garden is at the bottom left of the grid. Likewise, the bed along the drive is placed along the right vertical line of the rule of thirds grid. In the view, it ranges from the top to bottom (or front to back) of the garden. Finally, the line of the porch and the bed in front of it create a horizontal line in the top third of the image, in the “back” of the garden. This is the equivalent to the top third of an image in the rule of thirds. This next rule of composition is the most useful, in my opinion. The golden mean is easy to apply and its use automatically helps the garden gel. Understanding this simple rule of composition is akin to finding the perfect antidote to boring gardens. Watch this beautifully done video to learn what the golden mean is. Notice specifically the concepts of the golden rectangle, the golden spiral, and the golden triangle. In the garden, the golden mean is most often applied as a triangle or spiral shape, and reinforces the rule of thirds concept we just reviewed. Note those images which help you see the way that man and nature inherently demonstrate this rule. This is the same rule of proportion that causes us to identify some men and women as especially attractive. It is found in nature in a thousand ways. Man finds it restful and beautiful, and using this principle as you design will make your garden stand out. In the example garden, we see this rule of composition at work. The placement of the garden beds employs this rule. The long bed along the driveway has two curved areas that extend into the lawn. These two curves are perfectly in tune with the island bed introduced into the lawn. The triangle formed by the addition of that island bed picks up the golden mean. The three corners of the entire system of garden beds also form a golden mean triangle. The planting in front of the gazebo, the inside corner of the home, and the bed of pink impatiens form a perfect golden triangle. Using the same corner planting in front of the gazebo, you form another perfect golden mean triangle by drawing a line from that planting to the evergreen yew planting by the entrance, and again, that little island bed introduced into the lawn. Lastly, the sweep of the curves of all of the outside beds individually follow the lines of the golden sprial. These rules of composition work magic upon your garden spaces! Do you struggle with your plantings just “not looking right”? If you do, it is likely that one of these concepts is not being applied in the placement of your plantings, or in the lines you "draw" in the garden. Next time you notice a beautiful and dynamic garden, look for these principles at work. They will be there. Why pay for a landscape designer when these four rules of composition almost guarantee a beautiful result? Learn these rules of composition well, and all the other priniciples of design are the cream on top!